Garden incinerators & Fire Pits are currently presenting the fantastic Castmaster Medium Chiminea Cover at a brilliant price. Don't miss out - buy the Castmaster Medium Chiminea Cover online now! A Deluxe Medium cover which is suitable for Castmaster chimineas up to 90cms tall. 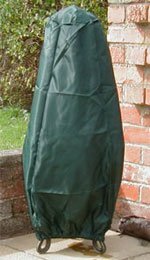 Hardwearing 100% waterproof polyester fitted chiminea cover with elasticated bottom. UV stabilized. Cover measures approx 82cm in length and 40cm at the widest part.